» Mike Nevins on A. A. 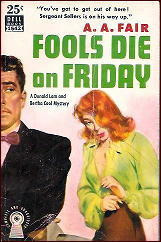 FAIR (Fools Die on Friday), WALTER KAUFMANN, and More AVALLONEISMS. Mike Nevins on A. A. FAIR (Fools Die on Friday), WALTER KAUFMANN, and More AVALLONEISMS. For my last column I revisited one of the Bertha Cool/Donald Lam novels written by Erle Stanley Gardner as A.A. Fair, and for this one I tackled another. Fools Die on Friday (1947) is more straightforward than Bedrooms Have Windows and the plotting more under Gardner’s control. The firm is hired to protect a real-estate tycoon from having his food poisoned by his second wife, who married him after his first wife died of, you guessed it, food poisoning. Donald quickly catches on that his new client isn’t who she claims to be. Then he devises a scam to delay the poison plot by posing as PR man for a manufacturer of anchovy paste and offering to put Wife Two in ads for the product. The realtor is poisoned anyway — with arsenic in the paste Donald left at his house as samples — and so is his wife. He recovers but she doesn’t. Then his secretary is strangled and Donald finds the body. Mixed into the ragout are a devious dentist, a machine that handicaps horse races, and a wandering package of arsenic. There’s very little detection in this opus, but the pace is furious (as usual with Gardner) and the climax, with one character literally getting away with murder, would never have been allowed in a contemporaneous Perry Mason novel since the Masons were being serialized in the Saturday Evening Post and the Cool/Lam books weren’t. I’ve never seen the word before in my life but Webster’s New International Dictionary assures me that it’s a genuine verb, meaning to pay or contribute. I wonder where Gardner came across it. Ever hear of Walter Kaufmann? He was born in Germany of Jewish parents in 1922, left his homeland on a scholarship to an American college just before Hitler launched World War II, returned to Germany with Military Intelligence during the war, and eventually was hired by Princeton University as a professor of philosophy. I discovered him in my teens and have been reading him all my life. The balance of this sentence is for our purposes (if I may cite a Gardnerism) incompetent, irrelevant and immaterial. I wouldn’t be surprised to learn that among Kaufmann’s favorite whodunits were those in which the detective acted as historian, for example Ellery Queen’s The Murderer Is a Fox (1945) and Josephine Tey’s The Daughter of Time (1952). We’ll never know for sure. Kaufmann died horribly in 1980 at age 58. Anyone interested in the details can access his brother Felix Kaufmann’s account of his death by googling both men’s names. Still bogged down as I am in the index for The Art of Detection, I’ll pad out this column to its usual length with the help of that nonpareil, that nonesuch, that Ed Word of the written wood, Michael Avallone. Over the decades I’ve culled from his 200-odd novels well over a thousand prime specimens of the Avalloneism. Both Bill Pronzini and I as well as some others have offered samples taken from his Ed Noon PI novels, but readers of this column are less likely to have seen those he perpetrated in the dozens of paperback Gothics he wrote under female bylines back in the Sixties. For a wild second, she wanted to run. (B)oth women could now hear the far off clang and trumpetry of the fire bells strategically placed all over Englishtown and vicinity. (20). Miraculously, the stone pillars and colonnades had held off the worse that the flames could do. (20). Of course, any number of Avallone’s Gothics are utterly devoid of such gems. When I find one of these I usually fling it across the room, snarling: “Why did I pungle up good money for this garbage? Someone edited it!” But so many of his immortal works are so lavishly studded with verbal cow pies that I could keep quoting like this till at least my 90th birthday. If there should be one. I’ve read Felix Kaufmans comments and I know something about the diagnostic problems and the result of treatment regarding an aortic aneurysm. My wife, Claude Marie Lane, had a series of mini-strokes and uneven if not indifferent health for several years. This included but was not limited to elevated blood pressure along with associated aches and pains. On the evening of 2 October 2008, on a day she had been given a clean bill of health from her cardiologist she experienced severe intermittent pain. Neither of us had any idea of what was going on. Ultimately paramedics were called and a ruptured aorta was diagnosed. Many hours of surgery later she was on the road to recovery, one that was compounded by other surgical interventions. She is now dead. It is clear, medically speaking, that these events cannot be diagnosed prior to occurrence, but it is equally clear that they are not the product of insects, lifestyle or location but rather a genetic pre-disposition. On a personal note, I thought her treatment excellent despite the considerable flaws in the Canadian medical system. Claude’s obituary is on line. Repeating my comments when you first informed me of your wife’s passing, from the photos in her online obituary, she was a fine-looking lady, and I’m sure you have many wonderful memories of your life together. My most sincere condolences to you and your family. Thank you. I made this statement because I thought Felix Kaufman had gotten it wrong and that I think personalizing it as I did may also have been inappropriate. It just came out. Aortic ruptures seem to be more about bad luck, and/or pre-disposition, than anything else. John Ritter had the same thing but was younger and stronger and did not make it into the operating room from what I understand. Add an aide to Hillary Clinton. In any case, I was simply caught in the moment. Mike, thank you for the teaser on Walter Kaufman. Those of us who have seen a loved one suffer without a plausible diagnosis can identify with this. Lucille Ball also died from a dissecting aortic aneurism as I recall. However, Lucy was seventy-seven. My heartfelt, though belated sympathies, Mr. Lane. Thank you. And dissecting aortic aneurism is the right term. I remember that about Lucille Ball, and that she was recovering. An opitcal illusion. As for age, We are up there. It was left to the small paperback publishers such as Belmont and Beagle to let Mike Avallone be published in his most inimitable fashion. They probably couldn’t afford copy editors and allowed his wonderful way with words be displayed in their full glory. And speaking of A. A. Fair, as Mike Nevins just did, I read TOP OF THE HEAP (1952) this past month, but only in bits and pieces while in and out and waiting in doctors offices. I didn’t think it fair to write up a review of something I’d read in such disjointed fashion, so I didn’t. While I enjoyed it, obviously, since I finished it, I was also able to step back from it and see it from a different perspective than that of a book I zoom right through. I could see how well-constructed the plot was from one angle and yet how creakily it was put together from another. It’s one of those books in which Lam and Cool are hired to do one thing but instead are being used by their client to accomplish something else. Lam sees through it right away, puts one and one together and right away gets three before he gets two. Lacking a “Watson” to bounce his ideas off of, we don’t see where he’s really going even though (or maybe because) he’s telling the story himself. I thought the middle was bogged down with too much financial talk and not enough action, but the first third is told well, and the real fun is seeing Donald win out over Bertha Cool once again by the time he’s done. Never doubt the Donald! I’ve read a half dozen or so Lam & Cool novels, but I was never able to warm up to them. Steve, I think you’re spot-on with your comment about small paperback publishers not proof-editing Avallone’s daffy writing. My husband’s abdominal aortic aneurysm showed up in x-rays of his kidneys (which were fine). Apparently, some aneurysms don’t grow, so he was x-rayed semiannually to measure growth of the aneurysm; after 2 years, it had grown to the point of requiring surgery, which was rough going. The vascular surgeon said emergency treatment has a 50% survival rate. It’s a sneaky, calamitous event—I’m grateful for the alert radiologist who just happened to notice. I enjoy the A. A. Fairs, and I’m delighted to learn of so many I haven’t read. Put me down as one of those who prefer the Lam and Cool books over the Masons. But I’m a huge fan of Gardner in any form. He and John Dickson Carr are the only two authors whose books I keep permanently. What you have written is so. Unfortunately we did not have any official medical alert. We had declining health and that was it. My initial thought, which continues to some degree, was to blame the Canadian medical establishment. But, this may have been a product personal incompetence rather than a systemic problem.